Yosemite National Park hotel information, address, phone and price. 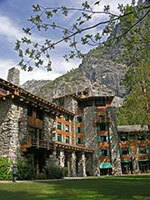 List of Hotels, Motels, Inn, lodging near Yosemite National Park in California. Fish Camp Yosemite hotels included in this list. Located at the gateway to Yosemite National Park in Groveland, CA. 3 star hotels in Yosemite National Park. Facilities : 13 hotel rooms or 6 vacation rentals, pet friendly rooms, Restaurant etc. 18736 Main Street, Groveland, CA 95321, United States. For reservation submit online booking form here and hotel will respond to you with special room rates and availability. Delaware North at Yosemite is an authorized concessioner for the National Park Service. Yosemite National Park hotel provides lodging (Ahwahnee Hotel, Wawona Hotel, Curry Village, Housekeeping Camp, Tuolumne Meadows Lodge, White Wolf Lodge, High Sierra Camps, Glacier Point Ski Hut), dining and activities in Yosemite. Operates 1,667 guest rooms, 25 Food and Beverage units, 19 retail locations, a wide range of guest tours and activities. Reservations are available 365 days in advance. Operated by Delaware North at Yosemite. 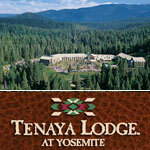 4 star Yosemite National Park Hotel Tenaya Lodge at Yosemite (Fish Camp, CA). 1122 Highway 41, PO Box 159, Fish Camp, CA 93623. Yosemite National Park Hotel Evergreen Lodge Yosemite (Groveland, CA). Mountain resort nestled in the woods bordering Yosemite National Park. 33160 Evergreen Rd, Groveland, CA 95321. 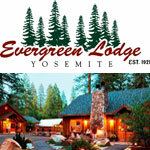 For Evergreen Lodge Hotel reservations, call (209) 379-2606, email, or book online.